Whole30 meatballs made of turkey, sweet potato and almond flour. Plus, a recipe for a killer homemade Whole30 barbecue sauce on top! I’ve heard it said that the success of any Whole30 is largely dependent upon a great meatball recipe. Ok, I’m the only person that actually says that. However, I can completely vouch for this claim–just when you can’t stand the sight of another hardboiled egg but need a similar orb of protein, the meatball is there for you. It’s even there for you at breakfast, if you want to mix it into my Cauliflower Fried Rice. 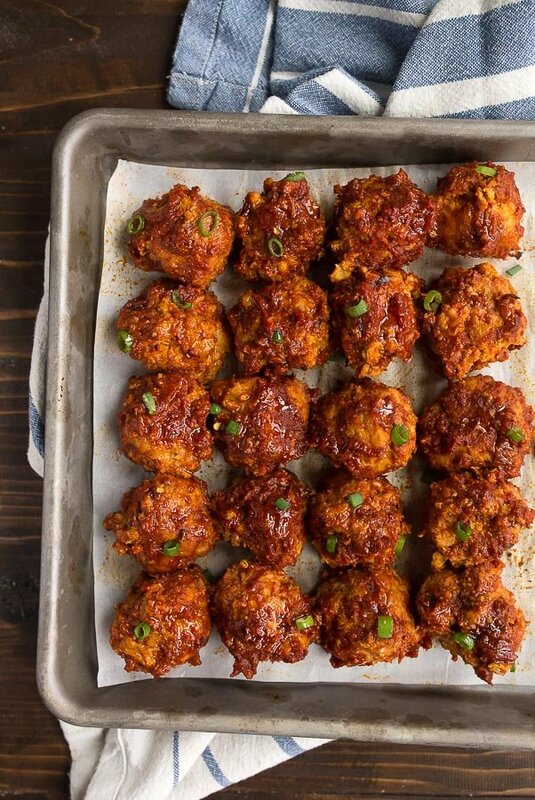 Specifically, these turkey sweet potato meatballs made with almond flour. They’re so tender that they cross into the comforting meatballs category. You know what I mean by comfort meatballs, right? There are fried meatballs for perching atop pasta and marinara sauce, and then there are soft, tender meatballs meant for piling over mashed potatoes with gravy. If you still can’t visualize the difference between Italian meatballs and comfort meatballs, think IKEA. Are you with me now? The Pioneer Woman introduced me to the comforting meatball variety. Her recipe has white bread and milk, which makes the meatballs so soft that they barely hold together. This is exactly how you want them. For a Whole30 meatballs swap, I used mashed sweet potatoes. They provide the moisture and fluff that milk offers. Similarly to Ree’s recipe, these Whole30 meatballs are very delicate and are best scooped, not rolled. I use a cookie dough scoop to get these from the bowl to the baking sheet quickly. Make sure to line your baking sheet with parchment paper for easy clean-up. Since we’re making soft and comforting Whole30 meatballs, the next level of comfort for me is a great barbecue sauce. Making Whole30 barbecue sauce is shockingly easier than I imagined. And, I want to say that I made this Whole30 barbecue sauce before I was too far into Whole30, so my tastebuds still ‘remembered’ what the real sauce tasted like. The basis for a great homemade barbecue sauce is: smoked paprika, tang from tomatoes and vinegar, and a little sweetness. I also think a hefty dose of black pepper drives the flavor home, too. If you didn’t know, I’m from Texas and am very particular about barbecue sauces, so you can trust me on this! To make the Whole30 barbecue sauce, just pile everything together into a small saucepan, turn the heat to medium and let it simmer for about 10 minutes. Use an immersion blender right in the pan to make everything super smooth. Taste and add crushed red pepper flakes if you like a spicy barbecue sauce. 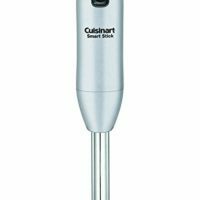 If you’ve never used an immersion blender, you will love how convenient it is! 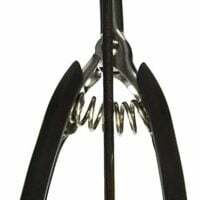 No more transferring sauces to a blender to puree! Just place the stick blender right into the pan, puree, and you’re done. It’s a game changer in the kitchen, especially when you embark upon a journey to make most of your food from scratch. 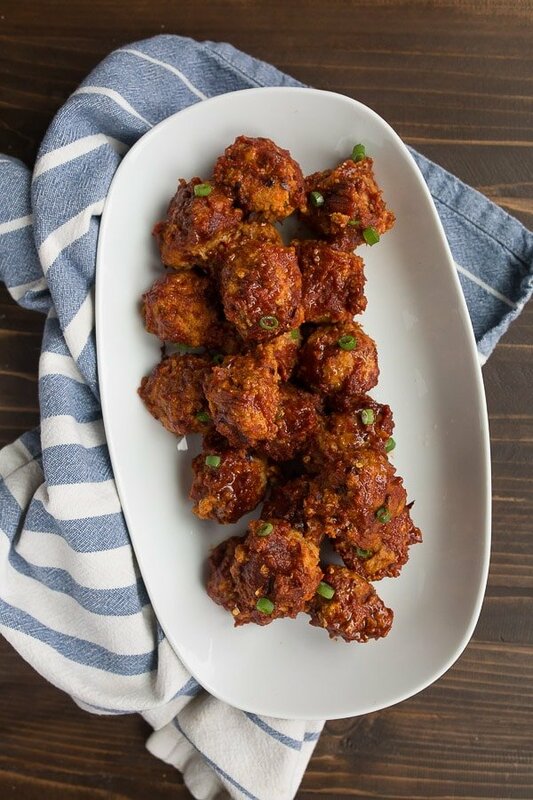 After we wrap up this Whole30 challenge, I will still make these perfect meatballs, though I will most likely use store-bought barbecue sauce instead of making my own. The barbecue sauce works in a pinch, and I could see myself doubling the recipe to pile into sweet potatoes with shredded chicken for another easy Whole30 dinner. I like to serve these meatballs with the roasted potatoes and pepper from my Whole30 salmon cakes recipe. I also have envisions of serving these meatballs next week over some mashed potatoes that are somehow dairy-free, though I’m not entirely sure how this will come together. I’m envisioning an olive oil and bone broth type of mash. I will keep you updated! I hope you guys are doing great on Whole30! If not, please find me on instagram so we can commiserate together. This week, I had to make 2 small batches of French macarons that I couldn’t eat, and it was pure torture. It’s okay, though, they’re no longer in my house and I’m recovering. I also just wanted to drop a note here that while my husband and I are doing Whole30, we’re not subjecting our 3-year old to it. As a result, we have plenty of tempting food around the house. So far, Camille hasn’t asked why we’re not eating bread with her or glugging heavy cream into our tea like normal. I need to prepare something to say to her, because I’m adamant about my daughter never learning about ‘diet culture.’ Even more so, I’m committed to raising her in an environment where I never refer to my body in a negative way. Positive body image is directly inherited from mother to child, in my opinion. Whole30 meatballs made of ground turkey and sweet potato. So soft and comforting, plus an amazing homemade barbecue sauce. Combine all of the ingredients for the barbecue sauce in a small saucepan. Turn the heat to medium, and let it simmer for about 10 minutes. After 10 minutes, remove from the heat, and use an immersion blender (or stick blender) directly in the pan to puree the sauce. Add 1-2 tablespoons of water if the sauce seems too thick. Let cool. Meanwhile, preheat the oven to 400-degrees F. Line a sheet pan with parchment paper for easy clean-up. 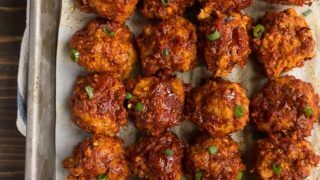 Make the meatballs: In a large bowl, combine the turkey, sweet potato, egg, almond flour, garlic granules, salt and pepper. Mix very well. Using a cookie scoop, portion out the meatballs directly onto the pan. The mixture is very soft and can't be rolled in your hands that well, so scoop them directly onto the sheet pan. Pour about three-quarters of the barbecue sauce over the meatballs, and use a spoon to gently cover each meatball. The meatballs are too delicate to toss in the sauce, so just do your best to cover them mostly in the sauce. Bake for 18-19 minutes, and serve with the leftover barbecue sauce on the side. *Coconut aminos is the Whole30 compliant version of soy sauce. Use regular soy sauce if you're not following the Whole30 diet. **If you're not following the Whole30 diet, 3 tablespoons of molasses is a great substitute for the dates. Plus, you don't have to puree the sauce if you use molasses. I think your determination to not transfer any negative body image baggage to your daughter is commendable. Whole30 isn’t really a diet, not like WeightWatchers or Atkins. At first it’s an experiment, and then, hopefully, a lifestyle change; and I have never come away from their website thinking it was about appearance and weight. I think a good explanation for the kiddo is that you are experimenting to see if any foods make you feel icky, and the best way to do that is to stop eating those foods for awhile and then pay attention to how you feel when you start eating them again. It isn’t about body IMAGE, it’s about taking care of your body/health. I don’t think that’s a negative idea at all. Thanks for these Whole30 recipes! I am doing Whole30 also this month. You’re one of my favorite bloggers, and I’m so inspired that you are doing this. It’s been a shock going from mostly vegetarian to tons of meat. It’s not my favorite culinary experience, but I’m feeling good physically. I’m going to add all of your recipes to next week’s meal plan!! 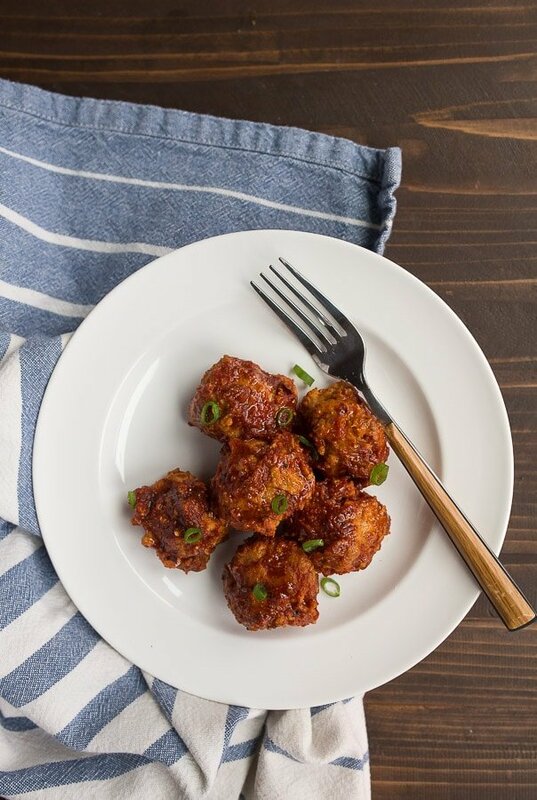 I’m not doing whole30–I hate restrictive diets–but this meatball recipe sounds awesome. The addition of the sweet potato is a great way to sneak in some healthy complex carbs and extra nutrients instead of bread and milk. I’m definitely going to have to try this. Ok, I made these last night, subbing breadcrumbs and quick oats for the almond flour because, hello, economically challenged single gal here. BUT…these turned out so delicious! Tender and moist and felt like such a guilty treat, even though they were super healthy. Paired them with bacon wrapped asparagus and had the perfect meal. :) Totally easy to scale down to single gal portions, too. An all around win. Definitely putting these on my supper rotation.